Kabul (AFP) – Gunmen have killed at least five people and wounded eight others in an ongoing attack on Kabul’s Intercontinental Hotel, an official said Sunday, as panicked guests were seen climbing over balconies to escape. More than eleven hours after the assault began Afghan security forces were still clearing the hotel, with at least one of the four gunmen involved on the loose, a security source said. Dramatic images broadcast on Afghanistan’s Tolo News showed thick black smoke and flames billowing from the top of the six-floor hotel. It is not clear how many people are still inside the hotel, which was previously attacked by Taliban militants in 2011. 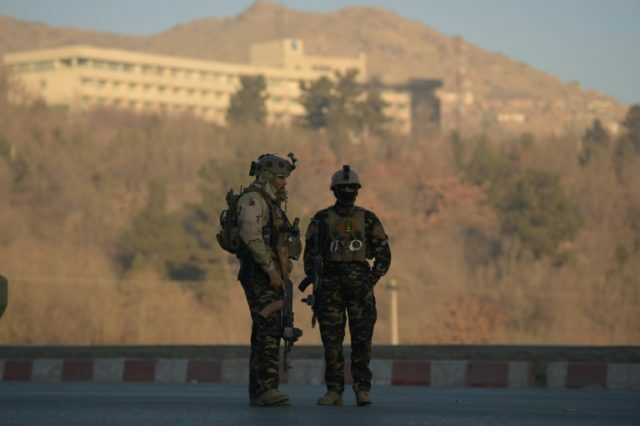 During the night special forces were lowered by helicopters onto the roof of the landmark hotel, interior ministry deputy spokesman Nasrat Rahimi told AFP earlier, adding two attackers had been killed. “I don’t know if the attackers are inside the hotel but I can hear gunfire from somewhere near the first floor,” the man, who did not want to be named, said by telephone.